Daniel Durning’s current sculptural installation “SPACE INVADERS” is on display at BWAC, and is visible in the main gallery, 1-6 weekends. The Installation runs from July 11 - August 16 with an artist reception on July 11, 1-6 pm. Red Hook Film Festival ... Free Films, Free Popcorn, and now... Free Key Lime Pie!! Red Hook International Film and Video Festival that is screening this weekend in Red Hook Brooklyn. The screening will take place at 1 pm. on October 3rd & 4th, 2009 at the Brooklyn Waterfront Artist's Coalition's (BWAC’s) Screening Room, 499 Van Brunt Street, Red Hook, Brooklyn, New York. Please go to the website for travel instructions www.redhookfilmfest.com . Daniel Durning’s current sculptural window installation “The Trance Icon” is on display at The Clinton Hill Art Gallery, and is visible from the street until 11pm daily. The Installation runs from Oct 1st – Oct. 25th with an artist reception on Oct.16th, 6-9 pm. 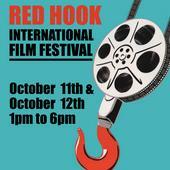 Red Hook International Film and Video Festival that is screening this weekend in Red Hook Brooklyn. The screening will take place at 1 pm. on October 11 & 12th, 2008 at the Brooklyn Waterfront Artist's Coalition's (BWAC’s) Screening Room, 499 Van Brunt Street, Red Hook, Brooklyn, New York. Please go to the website for travel instructions www.redhookfilm.com . 499 Van Brunt Street, Red Hook, Brooklyn, New York. Los Angeles Bent Festival - April 17th-19th, 2008. New York Bent Festival - April 24th-26th, 2008. Minneapolis Bent Festival - May 1st-3rd, 2008. Blip Festival 2007, a four-day music and multimedia event taking place in New York City November 29 - December 2, 2007.
is located at 279 Church Street between Franklin and White. 8Bit People Collective of New Musicians and Sound Geeks. CAA visits Dallas for the first time in history: the 96th Annual Conference will be held February 2023, 2008. The Adams Mark Hotel. Computer Animation Festival. screening will take place at FITs Haft Auditorium on September 27, 2007. Archived and Constantly Growing Library of Goodies. the archives of the program have become a scholarly resource of the art and aesthetics of new technologies in the contemporary art world.